Home | News | 3 nights for the price of 2 this Winter! 3 nights for the price of 2 this Winter! Why not treat yourself to a short break? Plymouth is a vibrant waterfront city, packed full of things for everyone to do come rain or shine among our city streets, surrounding countryside and coastline. There are well-known landmarks, historical sites and natural assets to explore across Plymouth’s many unique areas and districts. Wander around the cobbled streets of the Barbican, visit the Mayflower Steps where the Pilgrim Fathers set sail for America nearly 400 years ago or cross the footbridge from the Barbican to the National Marine Aquarium and walk through their Shark tank which also homes Rays and other Deep Water fish. Take advantage of our 3 for 2 Winter offer which is available throughout until the end of March 2019. *All Offers promoted by the Invicta Hotel are subject to room availability at the time of booking. We also reserve the right to remove them at any time. Please contact +44 (0)1752 664997 for further details. 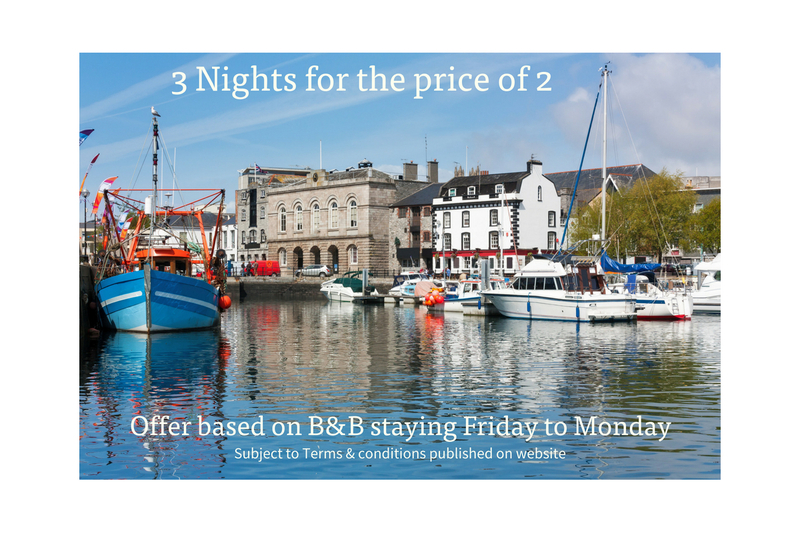 The 3for2 offer relates to guests booking in on a Friday and booking out on the following Monday. This offer is available from 1st November 2018 until 31st March 2019 and is ONLY available if ( rooms are available ) and if booked direct with the hotel, quoting the reference number 3FOR2 Winter 18. Unfortunately, we cannot offer this promotion via online booking agents or in conjunction with any other offer.